Testimonies are like beautiful plants. They grow a little at a time, and they need care and protection. Follow the directions below to make this plant healthy and bright. When you know something is true, you have a testimony of that truth. The Holy Ghost helps you understand the truth in your mind and gives you feelings of peace, happiness, light, or warmth in your heart. Color a flower on this page each time you read something below that you know is true. God is my loving Heavenly Father. Heavenly Father hears and answers my prayers. Because of the Atonement of Jesus Christ, I can live with Heavenly Father again someday. Joseph Smith restored the gospel to the earth. We have a prophet on earth today. The scriptures teach me what Heavenly Father wants me to know. Just as a plant grows when it receives water and sunlight, your testimony grows stronger as you make good choices. Below are some ways you can strengthen your testimony. 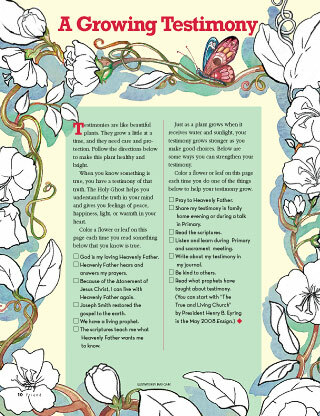 Color a leaf on this page each time you do something this month to help your testimony grow. Share my testimony in family home evening or during a talk in Primary. Listen and learn during Primary and sacrament meeting. Write about my testimony in my journal.